Does humour belong in Art? The question seems unnecessary. Of course do humour belong in Art. Still, most famous artists are seldom funny. Neither in their lifetime, or now. One of the exceptions is Danish Robert Storm Petersen (1882-1949), who transformed the great parody of ordinary life into fine art – both for the daily press, books or exhibitions. 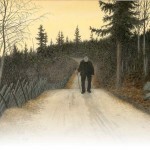 As a young man, he found inspiration in Munch, Ensor, Toulouse-Lautrec and Kittelsen. These impressions formed his artistic vision. We are proud to announce that Kittelsen will be devoted to a large special exhibition at the Storm P. museum, located at Frederiksberg in Copenhagen, opening for public at January 22nd. The exhibition consists of original drawings to the fairy tales, main works as “The Neck as a White Horse”, “On the Way to the Trolls Castle (Soria Moria)”, “Bullfinch”, “New Year’s New Moon” among others, his own series “Have animals got soul?” and “The Black Death” (including several reinterpretations in mixed medias), wooden works and various works in different techniques. 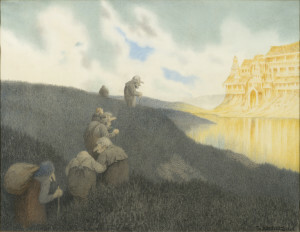 For an example some of his original illustrations for publications by Johan Herman Wessel, Holger Drachmann and Theodor Caspari, as well as his own “From Lofoten”.